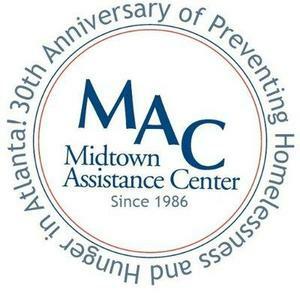 The Midtown Assistance Center (MAC) is a non-profit, interfaith organization whose mission is to provide emergency assistance to low-income working Atlantans to help prevent homelessness and hunger during periods of crisis. •Rent and Utilities: MAC provides assistance to low-income, working households that are in a temporary financial crisis to prevent eviction and disconnection of electricity, gas, and water. •Groceries: MAC has a food pantry that provides non-perishable food staples for households experiencing a temporary shortage. Even though MAC’s clients are below the poverty line, many are not eligible for food stamps. •Transportation: MAC provides transit passes for people job hunting, or with a new job, until they receive their first paycheck. •Clothing and Shoes: MAC's clothing closet provides men with interview and work outfits. MAC also purchases nonslip shoes and black pants for restaurant workers and steel-toed boots for construction workers. •Georgia Identification: Without ID, finding a job is nearly impossible. MAC helps pay for indigent people to get a state ID issued. Words cannot express my gratitude. Without your help, my daughter and I would have had nowhere to live.